We strive to provide complete care for our patients. Learn more about all the services we provide. And visit our NEW Online Pet Pharmacy! Advanced Veterinary Care of San Elijo offers our patient form(s) online so they can be completed in the convenience of your own home or office. If you are new to the San Elijo Hills area of North San Diego County or are a new pet owner, please stop by with your pet and visit Dr. Riehl and Dr. Thomas at Advanced Veterinary Care (AVC) of San Elijo. Drs. Riehl and Thomas just celebrated the third anniversary of the opening of their 2,400 square foot, state-of-the-art veterinary hospital in the Melrose Plaza shopping center at 1691 Melrose Drive, San Marcos. 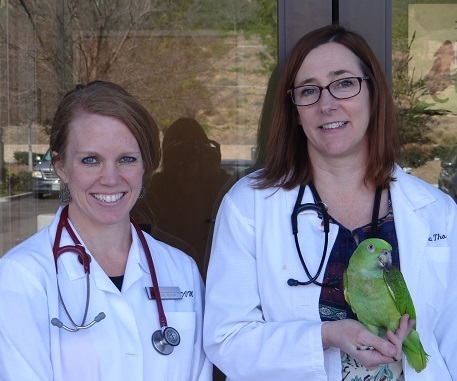 Both doctors have a lifetime passion for animal medicine and have found a new home in the San Elijo community. The hospital mission is: “To promote pet wellness and safety through client education, preventative medicine, and aggressive emergency care, when necessary.” A commitment to medical excellence and a desire to provide compassionate care for all pets are just two of the core values that define the doctors and staff of AVC. AVC has a strong educational mission and provides learning opportunities to the children in the community. Our Pet Awareness Workshop Series (PAWS) has been a huge hit with school children of all ages. The demand for PAWS is expanding, with requests from home-schoolers, Girl Scout and Boy Scout troops, and church groups. If you are interested in our PAWS program or just want to check out the pictures of past classes, click on the PAWS tab of our website. In addition to outstanding general practice veterinary services, AVC veterinarians provide comprehensive daytime emergency care services including blood transfusions, oxygen therapy, and emergency surgery. As a newer hospital, AVC utilizes some of the most advanced technology in the veterinary field. Centrally located in San Elijo Hills, AVC is a cutting-edge hospital uniquely located near the coalescence of San Marcos, Encinitas, Vista, La Costa, and Carlsbad. The AVC staff is second to none in the industry. Come in and meet us and see for yourself. You, and your pet, will be glad you did. If you would like to be added to our client list please call us at 760-736-3636 or email us. Sign-up using the form or call us at 760-736-3636 to take advantage of this exclusive offer.